We received a number of these products for review purposes. As always all opinions are honest and solely my own. Did you know an eight-year-old is considered a tween? Yup, apparently, tweens are children between 8-12 years of age. And for me, they are one of the hardest ages to shop for. I was blessed this year to have found a lot of fun items for that age group and wanted to share it with you in case you have been trying to figure it out as well. Teens have always seemed a little bit more easy to shop for because well, you can’t go wrong with video games and gift cards! 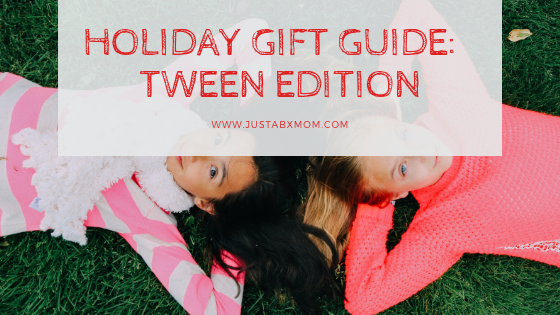 One of the things that make tweens difficult to shop for is that they don’t want to receive the same gifts that other littles in their life are getting. They want to be more like their older teen counterparts when in reality a lot of them still crave the comfort and fun of their younger counterparts. This year I love all of the plushie style pillows that are popping up. It is the perfect segue to go from stuffed animals to a love of pillows. Seriously, how many pillows do you currently have on your bed? That has to start somewhere. The first three items on my tween list are my top picks from all of the plushie pillows on the market. Moosh-Moosh Pillows – These pillow plushies come in over 72 styles. The styles range from four-inch clip-ons that work perfectly for teens to hang from their book bags to ten-inch ultimate size ones that are the perfect bedtime companion for a tween that is getting too old to sleep with a stuffed animal. Rainbocorns – These give tweens a taste of the unboxing craze and even had sequins which in case you didn’t know are one of the most hottest trends right now. Each Rainbocorn has a reversible sequin heart that reveals a magical surprise when swiped. Squishmallows – These have over fifty styles to choose from and range from 3.5 inches all the way to twenty inches! We got one of these for the first time last year and it was a monkey I named Banana. I love that little guy! And so do all the littles that come through my house, regardless of their age group. Before we get too far away from the squishy stuff let me share two more items that I think we get you some cool points with your tweens. Smooshy Mushy Bento – This is the perfect collectible for the tween in your life. Each bento box comes with a scented Smooshy pet, collector stickers, two mini scented besties and, a cute display tray. One of the mini besties is a blind bag for them to unwrap. Orbeez Spin and Soothe Hand Spa – Have you felt Orbeez before? They are one of the most addicting things to play with if you ask me. This hand spa is a wonderful addition to any tween’s beauty regimen. And if you are lucky they will plan an Orbeez spa day for you. After a relaxing day at the Orbeez spa, I am sure your tween will be ready for a yummy treat. Creative Cafe Barista Bar – If this isn’t one of the cutest things ever for those littles with caffeine loving mamas. Let your tween set their machine up near yours and you both can enjoy a frothy drink while catching up on each other’s days. Spas and cafes not your little’s thing? Don’t worry I have something for the active tween too. Look no further than Razor. I’m sure you have a scooter or four from Razor at home but has your little tried out this yet? Razor Jetts Mini Heel Wheels – They easily and securely attach to shoes US sizes 12 youth all the way up to 12 adult! These will have your little zooming around and getting those 60 minutes of recommended activity EASILY! Do you have a creative tween? I got them covered too. Linkt Athena Necklace Kit – This kit is amazing. It comes with enough material for your tween or teen to make seven necklaces. Talk about the gift that keeps on giving! When your tween completes this project it will be hard to believe how easy it was and how beautiful it will turn out. What would your tween do with all of the necklaces? My little would probably try to sell them! Stone Garden Transfer Art – The beautiful packaging will tell your tween that you know they aren’t a little kid anymore. This set comes with step by step instructions to allow your tween and you to feel and be quite the artist. You can use it to create the beginning of a family rock garden or your tween might decide to make some rocks for their friends because let’s face it, their friends are becoming more and more important every day. Bendy and The Ink Machine Buildable Scene Set – I like to think I have my hand on the pulse of toy trends but I can say I had no idea who Bendy and The Ink Machine was before my five-year-old came home and told me about it. She could only tell me so much because she only heard about it from a friend. Luckily, I have a few more years to figure it out before she becomes a teen and tween but in the meantime, I’m betting your tweens/teens can fill you in. And my final item could have been included in my bookshelf this month but I wanted to make sure that if you were just here for the tweens you wouldn’t miss it. Strong is the New Pretty: A Guided Journal For Girls -This journal was created with the tween girl in mind. It is written in a way that reminds the girls that it is okay to be silly. It serves s a guide in helping them answer questions about themselves that they might not even know they’re asking. And it reminds them that it is okay to continue using their imaginations.